Enjoy a great day out at the Wedding Fair at Metro Radio Arena in Newcastle on Saturday 27 and Sunday 28 January. We've got a fantastic 40% discount offer, as well as 5 pairs of tickets to give away to you, our lucky customers. The show has been running successfully for over 15 years in the spring and 2018 is set to be the biggest wedding event in the North East. The Wedding Fair is the perfect place to meet around 100 of the region's finest wedding specialists showcasing everything you need for your special day. You can try it, buy, book it, plan it and enjoy it as the exhibitors cover bridal wear, floristry, cake designers, venue hire and grooms wear with everything to create your perfect day. 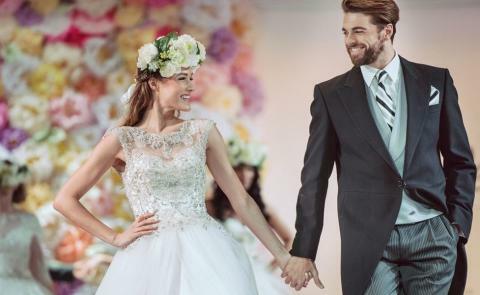 With dresses from the top designers to suit all tastes and budgets, the show is the perfect place to see, try on and buy your dream wedding dress. There's also some show only discounts, so you'll have the opportunity to save on your wedding essentials. So, relax and browse, maybe have a drink and let us get you there and back without the hassle of expensive parking. We’ve got 5 pairs of tickets to give away for the Wedding Fair and you could be one of our lucky winners. Competition entries will close at 2pm on Wednesday 24 January 2018 and we'll contact the winners directly. Get 40% off the on the day price if you buy your tickets in advance at theweddingfairs.co.uk using discount code 'GNBUS'.